I have so ma ny writers whom I love. A lot of times I’ll tweet my review of their books and many will hit a like button or say thank you. But, I’d love to be able to interact with them. To ask certain questions. Either about the book I just read or their other books. Wouldn’t you? Don’t you wonder why they chose to write from a female or male protagonist point of view? Or maybe why they decided to write from multiple points of view. Or why the character decided to go back home after a period of absence. Here are a few of my favorite questions. Your main character is an older woman (Britt-Marie Was Here). This book has an amazing timeline. It goes from the present to slightly backwards to further into the future to slightly more backwards. At first as a reader, I found it a bit confusing, but once I figured it out I loved it (All the Birds Singing). How did you write your story that way? Your book deals with a very difficult time in history. What made you select New York City as the setting (Chains) for moving your slave-girl from the South to the North during the Revolutionary War? This is one of my favorite books (A Gentleman in Moscow). I love your main character and his strict adherence to protocol in the 19th Century and early 20th Century. Me Before You is another of my favorite books. Not only did I love the story and it’s theme (assisted suicide), but also the gritty main character from a small community in England. My question has to do with the amazing title. Did the title come to you before your writing, during, or after the book was complete? Do you find that some books title themselves and was this one of them? 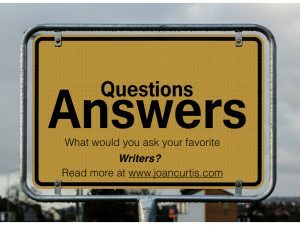 What are some of the questions you might ask your favorite authors? If you read my #books and have questions for me, let me know. 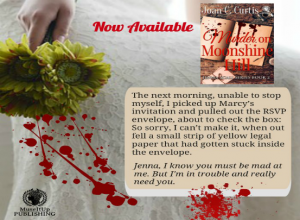 Take a look at this book trailer and see if it entices you to read the e-Murderer.